What is a Referral URL Detection? Referral URL Detection is a perfect option to display a popup campaign when the visitor comes from a specific URL. This option allows you to show extra-engaging messages to your visitors, based on their referral source. You can show special targeted messages to each visitor, based on their interest, whether they have come to you from Google, Instagram, or another website. 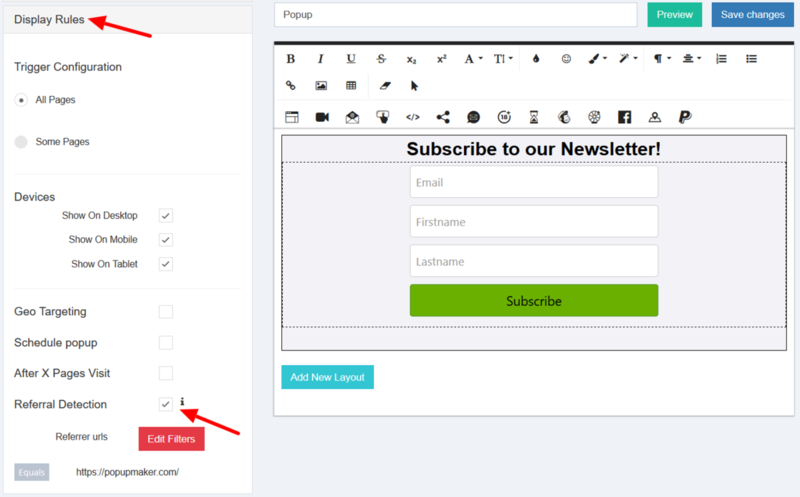 In the Display Rules section of the Popup Maker editor (the left side of the page) you can set up your popup to be shown depending on the referral URL the visitor has come to your site, with Referral Detection option. Simply click on the Referral Detection option and specify the referral URL to show a targetted offer to your users. 3 types of URL detection are available for your choice: Equals, Contains and Starts With. Equals - If this type is selected, you should enter the full URL to show the popup to the users coming from that exact page. Contains - Enter a part of the URL, so the popup will be shown to the users, coming from sites/pages, containg the part of the URL you have specified. Starts With - Enter the beginning of the site URL, so the popup will be shown to the users who come from any part of the URL you have specified as a start.